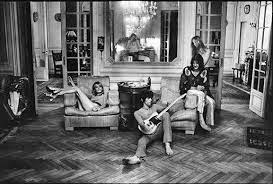 If Rock and Roll is a state of being, then what happened at Villa Nellcote, Nice, France, in the summer of 1971 is the genre's eternal zenith. You've heard the story. Stones fail to pay super high British taxes on their earnings. Taxman cometh. Stones have no cash. Stones forced to high tail it from England before they suffer legal sanction. Keith Richards finds a 16 room mansion overlooking the ocean in the South of France and a speedboat to go with it. Perfect. "Let's hang out for the summer; make an album and chill ... No studio at the Villa? No problem. We are the Greatest Rock and Roll Band in the World. We'll bring our own." So ensconced in their summer quarters, the Stones realized Rock Nirvana (or Hell, depending on one's view of things): drugs (copious amounts, even by their standards), supermodel groupies, A list guests (Gram Parsons was in town for a while and, oh, John Lennon dropped by), quarreling, cheating, disappearing, reappearing, narrowly avoiding arrest and deportation threats, speedboating, and other activities of the Greatest Rock Stars Ever at the height of their powers (i.e., scraping the bottom of the gutter). None of it could have happened in the Social Media World; the whole thing would have blown up like a hydrogen bomb two weeks in when Justin Bieber showed up and posted a selfie next to Richards and a giant pile of drugs and #nellcotemeltdown started trending. This Fire didn't need any help to burn out fast. Less then a year after Richards signed a lease on the Villa, the Stones had worn out their welcome and unceremoniously blown town. For a full and excellent account of the summer, see Robert Greenfield, Exile on Main Street: A Season in Hell With the Rolling Stones. As always, the Stones found inspiration from chaos. In the sweltering, musty basement of the Villa, against all odds, with every reason in the world to lay an egg, soil their reputation, and send themselves on a 20 year death spiral towards the Casino Circuit, what did they do? Recorded the backbone of the Greatest Rock and Roll Album That Ever Was or Will Be. Perhaps the finest song on Exile on Main Street, and thus one of the Greatest Rock and Roll Songs Ever Recorded, is the piano trip to the Heavens, "Loving Cup." You've heard it, but never like this. The official version of the song is too lovely, to clear, to have been born in a place as sordid as the Villa basement. Not this version. I can only imagine this alternate take arose at some point after 3:00 a.m. on a steamy July night, in the basement, in the middle of a deep human haze. All must have been quiet and dark on the heights of Cote d'Azur, all but the primal Rock wails in the night emanating from Nellcote. Lesser artists and softer men would have been beaten down by it all and laid about like overcooked sloths. Not our Heroes. When all seemed gone for the night, and there was nothing left to do but quit and watch the sunrise, I can see Nicky Hopkins take the piano for just. one. more. I see an exhausted Charlie Watts calling up to the recording truck parked outside and asking Jimmy Miller for just a bit more tape. Like cosmic dust forming a nebula, the song rises slowly from the haze. Bit by bit, the players find their parts. Mick Taylor, barely upright, summons just a bit more masterpiece country blues from his Les Paul. 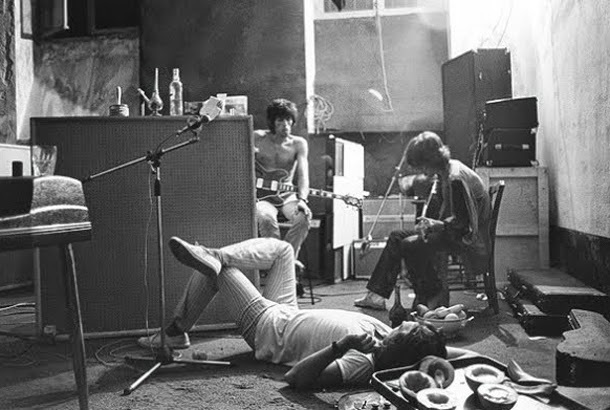 There could only have been one microphone in the middle of the floor, under a hanging bulb, with Jagger and Richards manning it. From chaos, comes art. "What a beautiful buzz!"